The former site of the Ambassador Hotel and its fabled Cocoanut Grove nightclub, today sit behind bars like a fortress on Wilshire Boulevard. The once inviting motorist’s entrance seems like an out of place remnant to the unsuspecting eye, and there are few other clues that this site was once the location of the essential Ambassador and its Grove. In its heyday, the Ambassador “witnessed the gamut of all conditions, robbery, murder, drunkenness, despair, marriage, divorce, illicit affairs, orgies, pranks, fights, suicides, frustration, and mate-swapping.” Today, the hedonistic sites and sounds of the former hotel resort have been replaced by the students and school bells of the Robert F. Kennedy Community Schools complex. The decorative scheme of the rooms includes pastel tints in the furniture, delicate cretonne, attractive English prints and original paintings on the walls. Ten thousand chairs were needed to furnish the hotel… 4000 diners can be accommodated at one time, Twelve hundred persons alone can be seated in the main dining-room, which covers half an acre of floor space. Hanging window boxes and stately palms provide the decorative scheme… The hotel is surrounded by spacious lawns and a quarter of a million trees, plants and shrubs, including many old palms. Waitress at the Ambassador Hotel. Lido Pool and Beach at the Ambassador Hotel. …on the night of April 21, 1921… the new club officially opened its Moroccan style, gold leaf and etched palm tree doors... The Cocoanut Grove was aptly named, guests agreed as they were escorted by the maître de and captains down the wide plush grand staircase... Overhead, soaring about the room were cocoanut trees of papier mache, cocoanuts and palm fronds which had been rescued from the sandy beaches of Oxnard where they had served as atmosphere of the 1921 classic, The Sheik. Swinging from their branches were stuffed monkeys blinking at the revelers with their electrified amber eyes. Stars twinkled in the blue ceiling sky, and on the southernmost wall hung a full Hawaiian moon presiding over a painted landscape and splashing waterfall. Menu from the Cocoanut Grove. (From left) Alan Campbell, Frances Cagney, Dorothy Parker, and James Cagney at the Cocoanut Grove. The "Las Floristas 17th Annual Floral Headdress Ball" at the Cocoanut Grove. 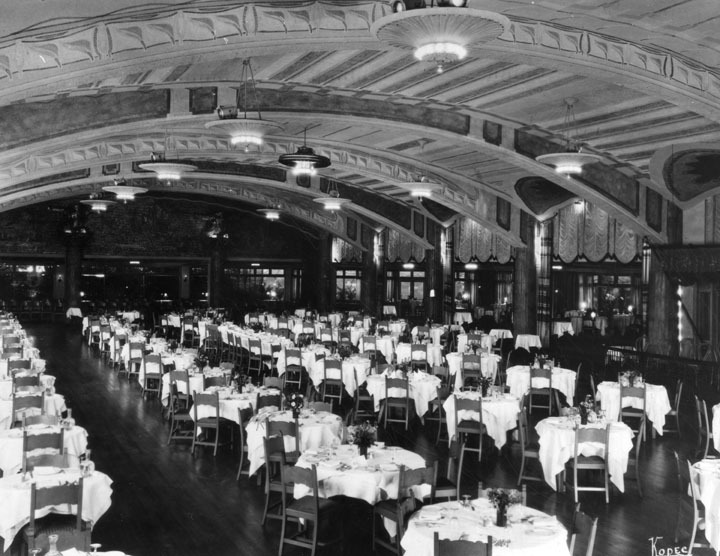 The Cocoanut Grove at the Ambassador Hotel. There was some decorum at times, however. Several Academy Awards ceremonies were held at the Grove. WWII servicemen mingled with movie stars at numerous galas and fundraising events to help with war efforts. And Hollywood idols took a break from their shenanigans to entertain guests during the beloved “Star Night.” One MGM short film, Star Night at the Cocoanut Grove, showcases “a galaxy of film stars” singing, dancing, and joking the evening away in Technicolor. The film is a magnificent look into the energy and ambiance that encapsulated the Gove’s guests in 1934. These early days of the Ambassador and Grove’s success could not have predicted their eventual downfall. The 15th Annual Academy Awards at the Cocoanut Grove. Robert F. Kennedy at the Ambassador Hotel after the California Democratic Primary. 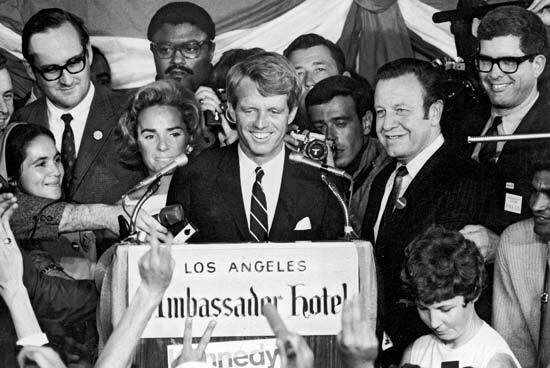 On June 5, 1968, would-be presidential nominee Robert F. Kennedy, high off of winning the California presidential primary, addressed an excited crowd of hopeful supporters at the Ambassador Hotel. Moments later, Kennedy was fighting for his life after being shot by Sirhan Sirhan, a Jordanian nationalist, in the kitchen of the Ambassador. Since its inception, Los Angeles has been focused on the new, the now, the better, and as a result, is ridden with architectural ghosts. So perhaps the decline of the Ambassador was inevitable. Nevertheless, the assassination of RFK marked the downward turning point in the hotel’s history. The Ambassador closed out the 1960s reeling from Kennedy’s assassination, and ushered in a new decade with a modernization attempt of the Cocoanut Grove. Under the direction of Sammy Davis, Jr., the “Now Grove” replaced the classic Cocoanut Grove in 1970, to appeal to a modern nightclub crowd. This era also saw a massive decline in LA as drugs and poverty infiltrated the Wilshire corridor that the Ambassador once led the charge in developing. Patrons lost interest in the neighborhood and hotel, and the once glamorous Ambassador began to fall into disrepair. During this time, film crews took advantage of the Ambassador’s size, location, and increasingly empty corridors, making it one of the most frequented shooting locations throughout the 1980s and 1990s. By the late 1980s, most of the hotel’s guestrooms were out of use, and in 1989, the decaying hotel formally closed its doors. To make a very complicated story short, the years following the Ambassador’s closure found the hotel entangled in a battle between preservationists, the Los Angeles Board of Education, and failed reality TV star, Donald Trump—all with very different ideas about the future and fate of the site. In 2005, film crews wrapped up their final shoot, and preservationists wept as the hotel was demolished to make way for a new school complex. For more reading on the Ambassador’s legal battles and final years, we suggest this 1998 LA Magazine article. As we pulled up to the former site of the hotel, directly across the street from the once hat-shaped Brown Derby outpost on Wilshire Boulevard, we found our first clue. Hidden in plain sight is the former motorist’s entryway. The bronze female statue is a modern recreation of the original (rumored to be modeled after Betty Grable); the A-M-B-A-S-S-A-D-O-R large block letters are missing, but the tower still stands; an art deco “hotel” sign points to nowhere; and intricate etchings tell the story of the hotel that once was. Unfortunately, the long, winding road leading to the former hotel is now part of the school fortress. It took a few tries, but we eventually found a way onto the property (hint: weekends are busy with school soccer games and a great time to take advantage of an open gate). Entrance to the Ambassador Hotel. Old entrance to the Ambassador Hotel. We quickly found the original entrance to the hotel – the only original structural remnant left after the 2005 demolition. It was here where guests once exited their cars and limousines for an overnight stay or evening at the Grove, and presumably where the Fitzgeralds once came zooming in atop their taxi. The iconic circular entryway, art deco clock, vibrant tile, and windows that once housed hotel shops, were all still standing. We were transported to the old Ambassador for a brief moment, but student artwork, cheers from the soccer sidelines, and a peek inside the window to reveal a cafeteria where the former banana-leaf-clad coffee shop once stood, quickly snapped us back to reality. We hurried our way through the campus, and a few wrong turns later, found the Cocoanut Grove doors. While not the originals, they are a faithful recreation of the gold etched palm tree, cocoanut, and monkey-clad doors that once greeted throngs of nightlife revelers ready to dance the night away. Today, they lead into the student auditorium that physically sits in the exact spot that the Grove once did. The doors were sadly locked, but we understand that inside the auditorium, the original Cocoanut Grove motif is alive and well. We can only hope that the school’s students honor and appreciate the history that remains of the Ambassador Hotel and its beloved Cocoanut Grove. Doors to the Cocoanut Grove. Replica doors to the Cocoanut Grove, now the entrance to the Cocoanut Grove Auditorium at the RFK Community Schools. Photo via Los Angeles Public Library (1930). Photo via Los Angeles Public Library by Herman Schultheis (1937). Photo via Los Angeles Public Library (1952). Photo via Culinary Institute of America (1957). Photo via Los Angeles Public Library (1961). Photo via Los Angeles Public Library by Gary Leonard (2004). The Ambassador Hotel and Cocoanut Grove were formerly located at 3400 Wilshire Boulevard and is now the location of the RFK Community Schools. Are the Stars Out Tonight?, Margaret Tant Burke. "BRILLIANT SCENE MARKS AMBASSADOR'S OPENING." Los Angeles Times (1886-1922): 2. Jan 19 1921. ProQuest. Web. 10 Dec. 2017. Cummings, Judith. "CALIFORNIA SYMBOL OF AN ERA IS IN DECLINE." The New York Times. 19 June 1987. Web. 13 Dec. 2017. "FIVE-MILLION-DOLLAR HOSTELRY IS OPENED." Los Angeles Times (1886-1922): 2. 1921. ProQuest. Web. 10 Dec. 2017. Mathison, Dirk. "Heartbreak Hotel." Editorial. Los Angeles Magazine June 1998: 77-85. Web. 12 Dec. 2017. "Sammy Davis Wins by a Snakeskin." Los Angeles Times (1923-Current File): 1. Apr 20 1970. ProQuest. Web. 12 Dec. 2017. Smith, Dakota. "New Wilshire Boulevard Sculpture Lady Explained." Curbed LA. 12 Apr. 2010. Web. 13 Dec. 2017. 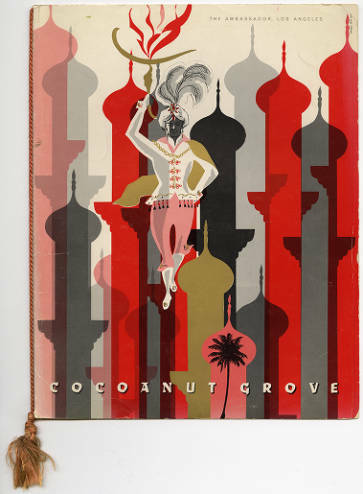 "Star Night at the Cocoanut Grove." YouTube. 01 May 2016. Web. 13 Dec. 2017. "THOUSANDS WILL ATTEND AMBASSADOR'S OPENING." Los Angeles Times (1886-1922): 1. Jan 16 1921. ProQuest. Web. 10 Dec. 2017.